The top market movers for this week could also be the top market drivers for the rest of the year, for traders and investors of stocks, forex, and most other global markets. Their common denominator and lesson is that we’re in a time of money printing and our greatest challenge as investors is how to deal with that and other elements of financial repression. Read on for details and guidance on how to cope. 1. US FISCAL CLIFF: HOW MUCH AUSTERITY COMING? Bullish: Thus far both sides sounding conciliatory want deal. –Per UBS’s Art Cashin: Washington was empty anyway with Congress on recess (vacation) so no one around to issue provocative statements. No news was good news. –Per Nomura’s Lewis Alexander: As yet there has been no meaningful or actual agreement on anything, and there’s no evidence that 2 sides have exchanged much less agree to specific proposals on what tax hikes and/or spending cuts stay or go. –Killing the US economy with too much austerity so that these measures become self defeating. Too much austerity and the US falls into recession. The bigger risk is that austerity means growth falls as fast or faster than GDP. Thus despite the spending cuts and tax increases, the debt/GDP ratio doesn’t improve, or worsens, making these austerity moves self defeating. Those warning about this cite how premature tightening in 1938 and killed off a modest recovery in the US, as it did in Japan in past decades. –Too little and that much more debt to cut later, that much a bigger fiscal cliff later of higher taxes and spending, higher risk that credit markets see that US not serious or able to cut deficit and risk the Ritholz/Reinhart ‘bang’ moment, the instant when bond markets lose confidence in the credit worthiness of a nation and start raising US borrowing costs) coming sooner. The cautionary lesson is the GIIPS experience especially Greece and EU in general. The less the uncertainty and austerity, the more bullish it will be for risk assets like stocks and risk currencies. The opposite result will pressure markets lower. As Congress returns to Washington and gets back to work, we may get yet another week of quiet. However because the elections yielded essentially the same balance of power that was deadlocked over the debt ceiling in the summer of 2011, we could well see markets pressured by the same brinksmanship that we saw then as the clock runs down. In the US, because elections have kept the same balance of power in Washington, there’s an excellent chance that pro and anti austerity forces will remain just as deadlocked as they were in the debt ceiling crisis of 2011 and fail to produce a solution that both reduces the deficit and softens the blow of the Fiscal Cliff. If so, that leaves the Fed as the only force that can actually take meaningful policy steps. Whatever the outcome, remember that if an unresolved Fiscal Cliff hits, it only brings a recession that hurts. If the US deficit remains unresolved, that’s likely to bring an EU-type credit crisis that kills. About 70% of the largest economy’s GDP is consumer spending. More of that happens in the next 5-7 weeks than at any other time of the year, so a lot is riding on the results of US holiday consumer spending. They will influence heavily influence US GDP, the global economic outlook in general, and in particular, the fate of stocks and other assets tied to the health of US consumer spending, both in the US and abroad. The biggest related data release for this week will be the CB consumer confidence report on Tuesday. While consumer budgets may already be set, they could be influenced by how the risk events discussed above (and below) progress. If threats of austerity from the Fiscal Cliff and of contagion from the EU appear to be receding, that will help consumer confidence. Coming economic data, which has been mixed at best, isn’t likely to do it. As noted above, quiet on the Fiscal Cliff (aka Austerity Cliff) and EU will only be bought in the near term with more money printing. Indeed, with record numbers of Americans unemployed or underemployed and receiving some form of entitlement payments that will ultimately need trimming if the US is to restrain its growing debt/GDP levels, longer term consumer spending remains tied to ongoing money printing to fund spending levels the US can’t sustain. On Monday EU finance ministers will meet to finalize the latest Greek aid package, which was delayed last week over disagreement over whether to extend the deadline for Greece returning to the bond markets. If they reach any kind of agreement that keeps Greece from defaulting, that should be bullish for risk assets. Just understand that the EU is in a crazy state of denial that cannot last. The only question is when the bearish longer term reality hits. Greece is clearly insolvent, and the austerity policies applied to it have been self defeating, shrinking Greece’s GDP as fast, or faster, than its debt and so ultimately Greece will need debt forgiveness if it is ever to self sufficient. However, admitting that taxpayer funds loaned to Greece (to repay banks) have been lost, remains politically impossible. Bailouts thus far wasted already amount to over 100% of Greek GDP. So the EU is instead now considering ways of easing the Greeks debt burden by a combination of lowering of rates and extension of maturities. Meanwhile, Greece is kept afloat by the following Ponzi scheme. The ECB lends real cash to Greek banks so that these banks can buy Greek bonds, which they then deposit with the ECB as if these bonds were legitimate collateral. The real disagreement among the parties funding Greece, the EU, ECB and IMF (aka the Troika) is over when to admit to the politically unpleasant fact that taxpayer funds lent to Greece are lost, and allow a default on enough of the debt to give Greece a realistic chance to recover. In sum we’ve got a paradox, the more the EU irresponsibly delays and worsens the impact of Greece’s ultimate default, the more bullish markets become. The end result will be a bigger default that will be a huge write down for the ECB’s Greek bonds held. The bigger danger is that the resulting fear spikes GIIPS borrowing costs and so is more likely to bring down Spain, Italy, or both. That means either the EU banking system crashes or it decides to print a lot of Euros to keep that banking system solvent. Yes, that risks reducing the value of the Euro dramatically, but the EU seems to prefer that to the alternative of an insolvent banking system and crashed EU or global economy. As noted in last week’s article, CRASH ALERT: A TOXIC MIX OF EVENTS HEADING INTO 2013, the biggest danger from the Fiscal Cliff and Greece (or any event that really scares markets) is that they raise risk aversion and Spain’s borrowing costs beyond its means, just as Spain needs sell well over 20 bln EUR of bonds from now until end January. If that happens Spain will need to request and receive ECB OMT aid fast. However, a deal setting conditions for getting this aid may not be available in time to avoid scaring markets and risking yet another EU crisis. €3.9 bln of bonds maturing in 2015, 2017 and 2021. The average yield on the 2021 debt was 5.517%, below the 5.65% rate on 10-year bonds in the secondary market. As noted below, we’ve significant evidence that risk aversion is indeed rising as evidenced by money flows into savings banks. If so, Spain’s bond yields will be rising, and with them, new EU anxiety. –it added to a series of events showing how the overall EU slowdown is reaching core funding nations, like Germany and Holland (GDP miss in Holland, slowing German GDP, PMIs throughout the EU showing 10 months of contraction, etc). –it means Moody’s will now examine at the EFSF rescue fund’s (and the ESM’s) Aaa rating in light of the French downgrade. The rescue funds – which include guarantees from those being rescued, only have their Aaa ratings because of the Aaa ratings of the major contributors like Germany, and…. (gulp) France. In sum the French downgrade may not be felt in the coming week, but may well weigh on markets in the coming weeks, especially if there’s deterioration in the EU debt crisis, because the French downgrade could undermine confidence in other funding nations’ credit worthiness, which in turn jeopardizes the EU’s rescue fund. If the EU rescue fund can’t issue low cost debt, the next best alternative could ultimately be some form of money printing. Next week we’ll have both US New Home Sales Wednesday and Pending Home Sales Thursday. Housing figures have beaten expectations lately, prompting all sorts of optimistic comments about housing. Here’s a classic case in which context is everything. 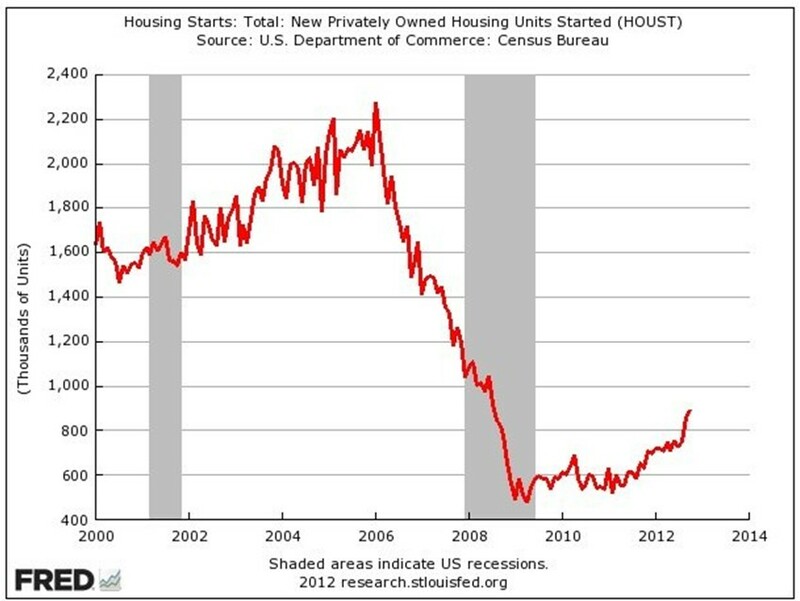 As the chart below shows, while housing starts have improved dramatically, they’d need to double just to reach their worst level from the last recession. In other words, even with historically low rates and beaten down prices, the housing sector remains crippled. There are signs of life, but it has a long way to go before it can generate any meaningful improvement in spending and jobs needed to drive a recovery. This week’s calendar brings new and pending home sales reports for the US. If they beat forecasts, that will be positive, but it will not materially change the current outlook for the sector or its contribution to US economy given the above. Don’t be fooled. As we’ve mentioned before, while the Fiscal Cliff is a recession threat, the contagion risk from a large sovereign default in the EU like Spain, possibly even a small one like Greece, is a depression and market collapse risk. The key to preventing an EU crisis is to prevent anything that scares markets badly and sends GIIPS bond yields soaring. Last week Zerohedge.com pointed out a disturbing warning sign. Those three episodes represent the biggest weekly Savings Deposits inflows number 2 through 4. 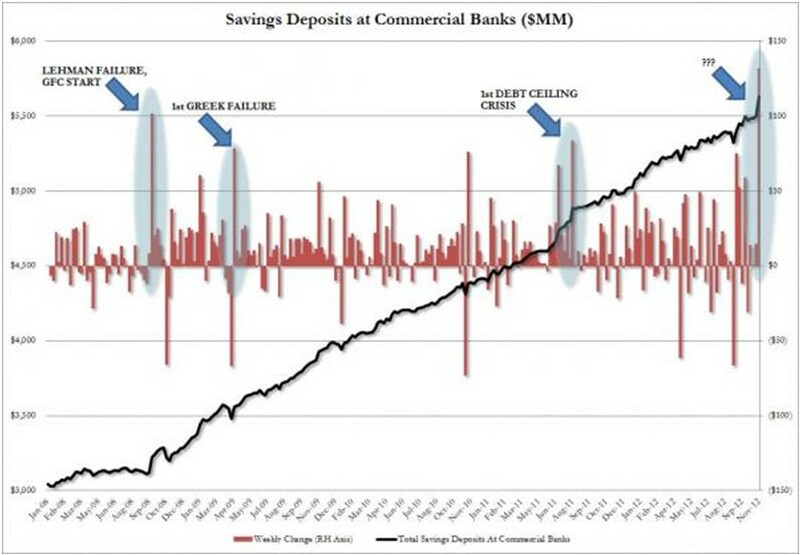 When was the largest ever inflow into Savings Deposits at Commercial banks, at $131.9 billion in one week? This past week. We don’t know, but the people who control $5.6 trillion in US commercial bank savings deposits – certainly not the vast majority of the US population who have virtually no money saved up, but the true 1% – just decided to park the most cash on a week over week basis into their savings accounts in history. Despite virtually zero interest rates and withdrawal limits of about 6 per month, the big players are seeking shelter in commercial bank savings accounts. The Nikkei, JPY currency pairs, and to a lesser extent other Asian markets, have gotten a boost in recent weeks from anticipated new BoJ money printing following the expected Opposition victory in the coming Japanese elections. Given that the Fed and soon ECB will be engaged in unlimited money printing, that Japan will do the same, if for no other reason than to defend its export markets. How much? Consider that the likely new Japanese PM, former PM Shinzo Abe recently was quoted as saying that the BoJ needs to continue unlimited easing until Japan has 3% inflation. The danger here isn’t that Abe fails, it’s that he succeeds. Even with its ultra low bond rates (supported in part by Japan’s low inflation), debt service comprises about 25% of Japan’s budget. 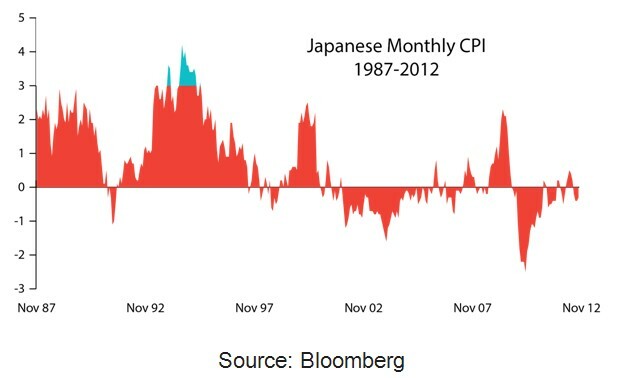 A mere 1% increase in those yields would double that expense and turn Japan into another EU sized debt crisis. Tuesday’s S&P/Case-Shiller home price index, new home sales for October (Wednesday), and October pending home sales data, due (Thursday). Look at the bellwether S&P 500 weekly chart below for a longer term perspective. 1. Downward Momentum Halted: The 50 week EMA (red) held as support. Combined with the bullish engulfing candle, AND a jump out of the Double Bollinger Band sell zone (bounded by the lower orange and green Bollinger bands) and we’ve got a setup for some kind of further move higher, likely limited to the upper range of the past 7 months around 1450 – not all that much upside, but enough for short term traders of the stocks or other risk assets like risk currencies. So, given the above fundamental and technical picture, how do we view the coming week and beyond? 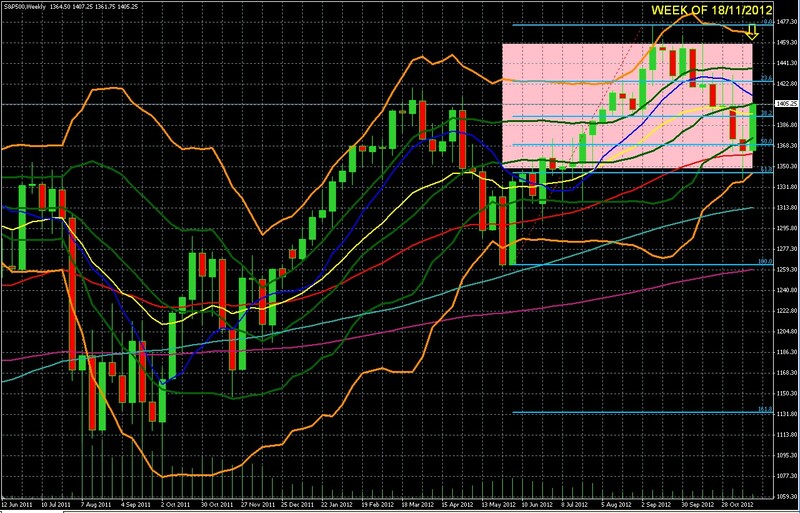 –Technical Picture: The above 2 points concerning the S&P chart, suggests more range-bound trade within the 1350-1450 range barring any significant changes in fundamentals or surprises in the news. –Fundamental Picture: The EU crisis, Fiscal Cliff and global economic data offer some potential short term bullish news as the first two near term threats are averted (or more likely, deferred yet again), but going into 2013 are more likely to bring bearish news. The most disturbing aspect common denominator among the big fundamental drivers is that most point towards a continued explosion in money printing and other forms of financial repression (measures by which governments channel funds to themselves in order to reduce their debt). 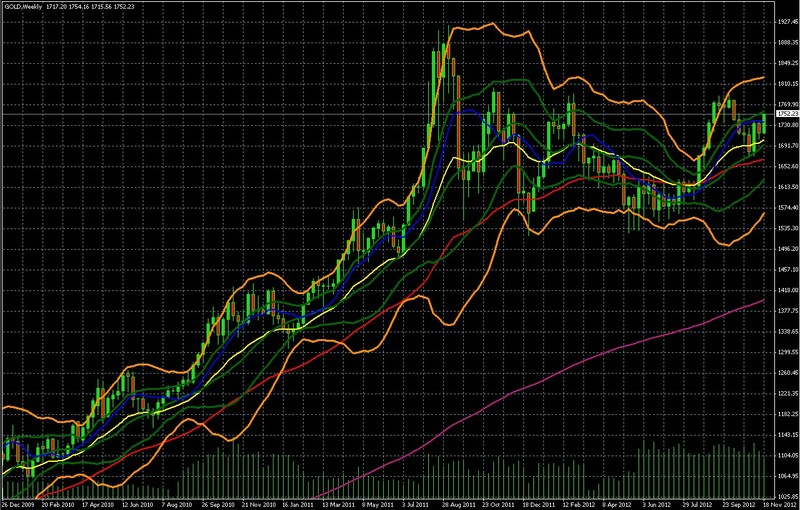 The weekly gold chart shown below supports this view. 1. The 20 week EMA (yellow) and 50 week EMA (red) together have provided both reliable support and trend indication over the past two years. 2. Gold has resumed its uptrend and looks ready to test annual resistance around 1810. 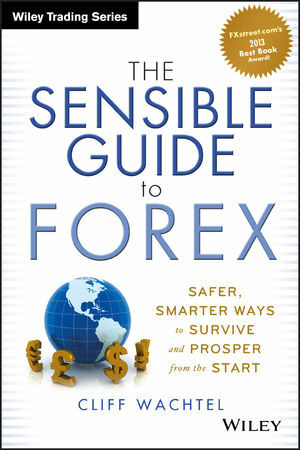 As I discuss in detail in my book, The Sensible Guide To Forex, gold, unlike virtually any other asset, gold is neither risk nor safety asset. Rather it functions primarily as a currency hedge. That is, demand for the most widely held currencies falls (usually due to concerns about their purchasing power), gold rises and vice versa. This makes sense given that as noted above, the central banks behind the USD, EUR, and JPY are all poised to continue to print and debase their currencies. They’re far from alone. Among other central banks, the Bank of England is on board to print (albeit in a more subtle fashion), meaning that all four of the most widely held currencies, in which most of the world’s financial assets are denominated, are losing their value relative to hard assets and currencies managed by responsible adults. The above mentioned currencies are going down, and they’ll drag down anything denominated in them, including your assets. That’s a real problem for most investors, who tend to have most of their wealth denominated in just one of these currencies. Clearly we need to diversify out of these currencies and get greater exposure to some combination of hard assets and assets denominated in the more responsibly managed currencies. That’s a problem for most investors, who need safer, simpler means of accessing these assets than the usual methods used in forex, commodity, or foreign real estate markets. See here or here for information on the latest, most comprehensive guide to these safer, simpler ways to protect yourself in the age of financial repression.